All New 3W Dimmable under cabinet LED puck light for recessed mounting (optional surface mount). LED puck light use LED COB lighting (Chips on Board); a new technology of LED packaging that provides a super bright beautiful clean LED light output without the spotting effect of traditional LED puck lights. With COB LEDs, Multi LED chips are packaged together as one lighting module creating an even-light look rather than the individual LED dots, reducing the glare while increasing the width of the LED light. Available in Warm White (3000K). 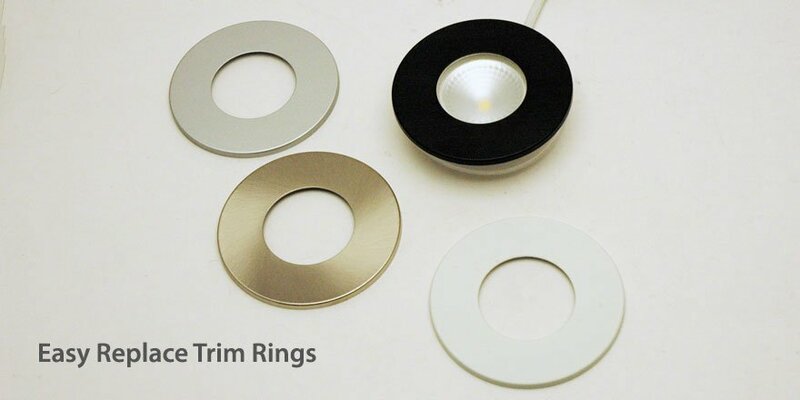 LED puck light comes with 4 different color trims to match your needs. 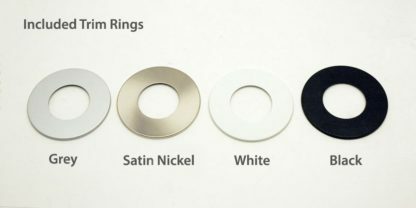 Trim colors are Grey, Satin Nickle, Black and White. 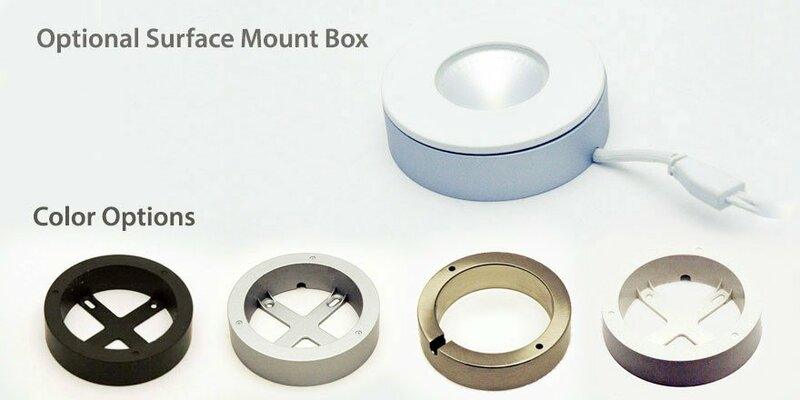 With optional Surface mount box, LED puck can be mounted on surface. Optional surface mount box comes in 4 colors (White, Black, Grey and Satin Nickel). 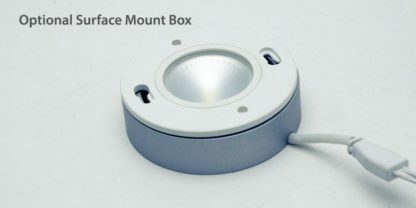 LED puck lights are easy to install and hide under most counter tops. In a typically application, the LEDs should be spaced 16″ to 20″ (0.5M) inches apart for best light output. 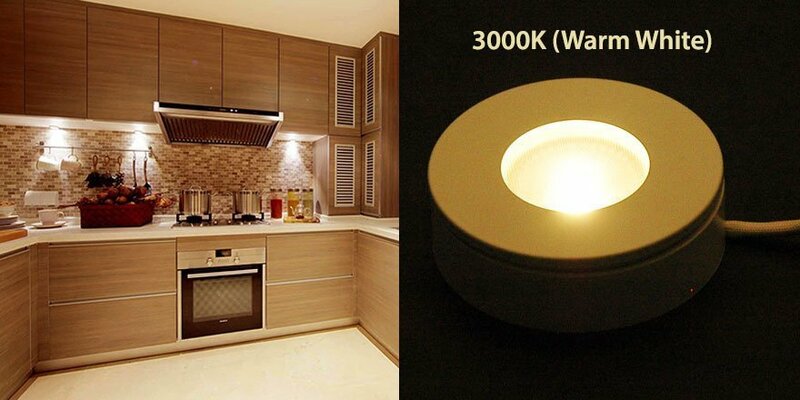 Requires a Class 2 12VDC dimmable LED Driver. Note: For Indoor Dry location use only. Note: Only Power with listed Class 2 drivers in a tab. 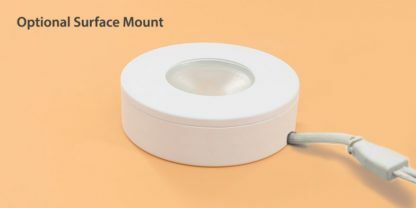 Under counter cabinet light uses only. New Multi-Dim 12VDC Class 2 Regulated Dimmable 24 Watt (2A) constant voltage LED Driver features outstanding LED dimming performance that is compatible with wide range of dimmers. Integrated microprocessor on driver automatically senses and optimizes performance based on the load and type of used dimming technology. The 50 Watt 12VDC CVD50L12DC is a Class 2 Constant Voltage LED Driver with 0-10V dimming availability. The UL Listed type enclosures has a built-in junction box on both input and output sides for easy hardwired installation. These drivers are IP65 rated and are suitable for both indoor and outdoor installations. 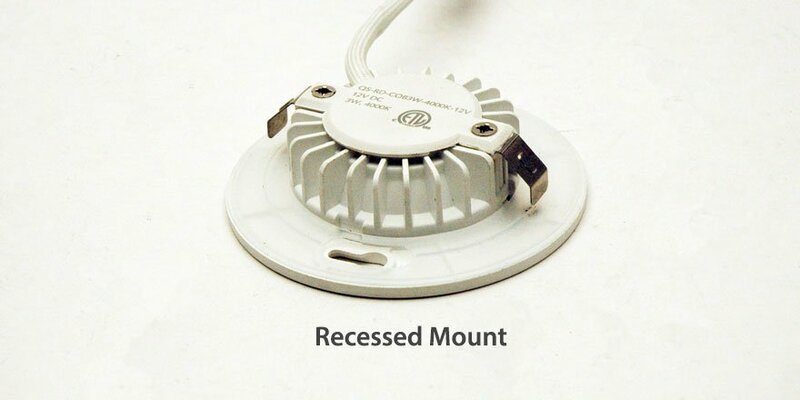 Surface Mount for Puck Light QS-RD-COB3W. Comes in 4 color options White, Black, Grey and Satin Nickel. Power Connector Extension wire for LED Puck Light. 20 AWG cable for Puck lights available in 2m (6.56ft) length. 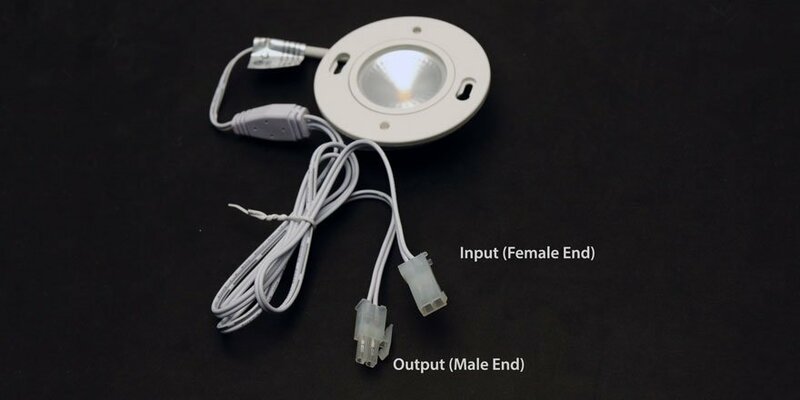 Extension wire extends connection length between Class 2 LED Driver and LED Puck Light.